Lt General Bipin Rawat will be the next chief of the India Army, the government announced today. 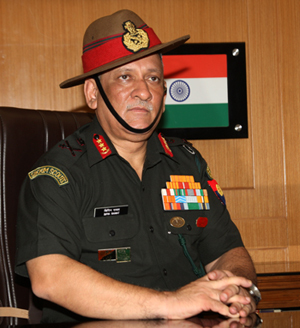 Lt General Rawat belongs to the famous 5th Battalion of 11th Gorkha Rifles. He is the current Vice Chief of Army Staff of Indian Army. Air Marshal BS Dhanoa meanwhile was named the next chief of the Indian Air Force. The Indian Army chief, General Dalbir Singh, and the Indian Air Force Chief Air Chief Marshal Arup Raha, are both set to retire on 31 December.